Timbuktu has some stirring visuals, but ultimately fails to be a stirring piece of art. Abrehmadinne Sissako’s Timbuktu entered as one of the exclusive (and meager) 18 films in the festival’s main competition slot with a muted response from the press. While most sites were buzzing about the possibility of a Paul Thomas Anderson, Terrence Malick, David Cronenberg or Mike Leigh, hardly anyone mentioned Sissako. Surely this has something to do with the lack of attention the whole African continent gets when it comes to movies (and, I fear, other art as well) so even if Timbuktu was a bad film, which it isn’t, the fact that it will be getting attention from the world’s biggest media outlets is its own reward. Whether it will get any traction after Cannes, however, is a different matter because for that the movie’s interior qualities need to support the weightiness of its outer shell. Sadly, they don’t. The film is a fragmented look at life under jihadist rule in Timbuktu, a city in Mali bordering the Saharan Desert. Some of the reoccurring characters include a herdsman and his small family living on the outskirts of the city walls, a mean-spirited fisherman, and a Jihadi soldier who provides much of the film’s comedy (surely a risky move by Sissako.) The thin narrative threads are woven around these people, whose lives intersect in one way or another, as the rule of law from the very strict Jihad perspective is enforced (music is placed on the same sinful level as cigarettes, and if you’re heard playing it you get a public lashing, the count of which is determined by Jihadi council) while religion commands absolutely everything. Without giving too much away, some of the conflicts that arise include the herdsman confronting the fisherman over an accident involving a cow, the Jihadi soldier teaching a young recruit how to act with conviction in front of the camera, and various instances of locals standing up to their oppressors, usually left to suffer the consequences. Sissako’s previous film, Bamako, was also set in Mali but in a much more intimate setting of a backyard. This time around, what’s patently clear is the leap taken toward something more cinematic than his previous effort, with artful cinematography and an emotive score especially more prominent. Yet even with Bamako’s lack of conventional feature film ingredients, it’s a more compelling story than Timbuktu. The latter spreads its wings by using humor (a scene featuring an impassioned discussion about war is revealed to be a fanatical debate on football) and takes advantage of the barren setting to create some momentous visuals, yet still remains a film so heavily steeped in politics and religion that it only works as a piece of historical source material, and not the kind of artistic expression most of us look for in movies. Moments of creativity or traditional storytelling feel either out of place, or hit the nail on the head with the subtlety of a sledgehammer. As important as it is in a political, moral, and historical sense, Timbuktu ultimately fails to be a stirring piece of art. The acting and the screenplay almost feel like alien concepts, as both seem too heavily reliant on the film’s message. 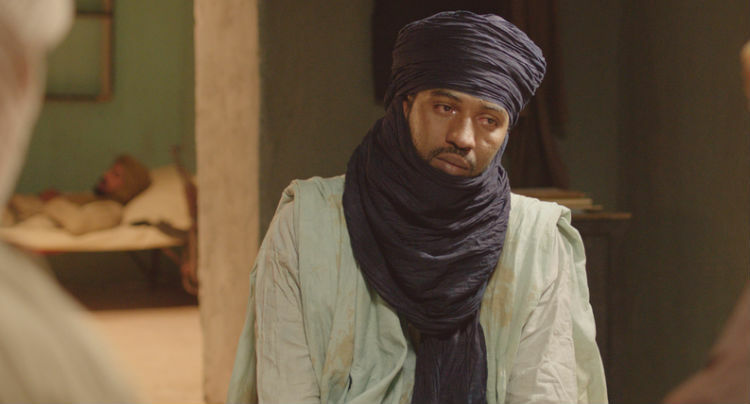 If we were to judge films on their political importance, and the ethical dilemmas proposed by their hefty messages, Timbuktu would most likely be a big contender for the Palme D’Or. As an example of cinematic storytelling, it’s a reminder that Sissako’s talents rest with more intimate, and less self-absorbed, material. Regardless of this, Timbuktu has some inspired visuals, and more than a handful of moments when the vulnerability of human life is captured with deft precision, as it clings to the rough edges of a complex religious system, and slowly tears your heart out. Our review for Timbuktu was originally published on May 14, 2014 during the Cannes Film Festival.